Senate Republicans are now seeking to fix this, by repealing the individual mandate as a part of their tax reform bill, the Tax Cuts and Jobs Act. However, Democrats seem to have had a change of heart regarding the mandate’s constitutionality. Sens. Al Franken (D-Minn.) and Jeff Merkley (D-Ore.) criticized their Republican counterparts for including the individual mandate in the tax reform bill. They forget that the only premise holding up their flawed healthcare system is the premise that the individual mandate is a tax. So, which is it? 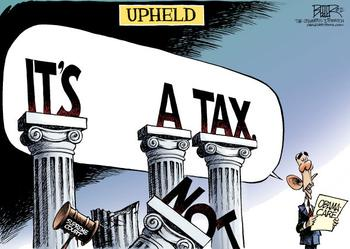 Is it a “constitutional” tax or is it an unconstitutional part of a government-run healthcare scheme? Those words are just as true today as they were back when candidate Obama was trying to sell himself to the American people, and the Congressional Budget Office's constant downward revisions of the number of people who would purchase health insurance coverage on the ObamaCare exchanges bear that out. When you put blind partisanship aside, the answer is quite clear: the individual mandate must go. It’s a regressive tax. According to the Internal Revenue Service, nearly 80 percent of American households subject to the individual mandate earn less than $50,000. The individual mandate is also unpopular. A February 2017 survey conducted by YouGov showed that 65 percent of Americans want the individual mandate repealed. There is no reason to continue to punish hard-working Americans for refusing to purchase a product that they may not need or cannot afford. Reforming the tax code will provide vast economic benefits for taxpayers, and repealing the individual mandate will only expand these benefits. This is unequivocally the right move.